This is the Hayabusa’s party trick. Smoke and carnage. Blazing sunshine, five epic bikes and beautiful scenery have got the SuperBike test team in a particularly happy mood. John’s feeding Quavers to some carp in the lake, while Al and I stare at the Hayabusa. From some angles it looks just right, in a purposeful, form follows aerodynamic function way. But take two steps further round and the lumps are all in the wrong places. I’m trying to come up with a suitable metaphor, when Al nudges me and points at Shaun fighting his way into his black one-piece undersuit. Either way, the latest colour schemes definitely help the ‘Busa, as do the additions of Brembo monobloc calipers and the black DLC fork sliders. The Suzuki Hayabusa will definitely go down in history as a legendary motorcycle, from the hype of it’s initial 200mph potential to the rare sense of humour shown by giving it a name that means ‘Blackbird eater’. In reality, it never quite tops the double ton in standard form and the Kawasaki’s ZZR1400 has it licked in a drag race too. But that’s not how the history books will recall it – the ‘Busa was and still is a phenomenally fast road bike, one that devours little back lanes like the M1 and one that feels like a drag bike when you’re on it. The tuning potential is massive – skid in to any drag racing event and half the bike field will be Hayabusas. When you climb on one, the long low setup instantly has you looking for staging lights and setting up for a launch. And that brings me nicely to one of the 1340cc Suzuki’s best party tricks – the cold tyre getaway. It goes like this – take bike out of van and warm engine (we’re not animals after all), park up at the start of a suitably wide and straight bit of road, being careful not to get any heat in to the rear tyre. Set the revs to about 9,000rpm, hold on really, really tight, lean forward and dump the clutch. The reward is a cacophonous riot of smoke, revs, mechanical strain and biological fear. 190bhp, dumped on cold rubber and fired out into forward motion, smoke and screams. Never waste a cold tyre. And lo, the hump back bridge was created and He said ‘Go forth and jump’. So we did. Amen. Some bikes just look like trouble. If the Hypermotard SP were a person, it’d have a permanent cheeky grin, shifty eyes and chronic ADHD. It’d be that guy that has to press every button just as they get out of an elevator. It’d be the guy that puts the handbrake on at 60mph when you’re in the hire car, the one who leaps in the hotel pool fully clothed and demands to be brought more beer. John’s just leant over my shoulder, read that last statement and pointed to a video of me pulling on the handbrake in a hire car at 60mph. I retaliate with a shot of him drinking beer underwater in someone else’s crash helmet. He responds with… you get the picture. 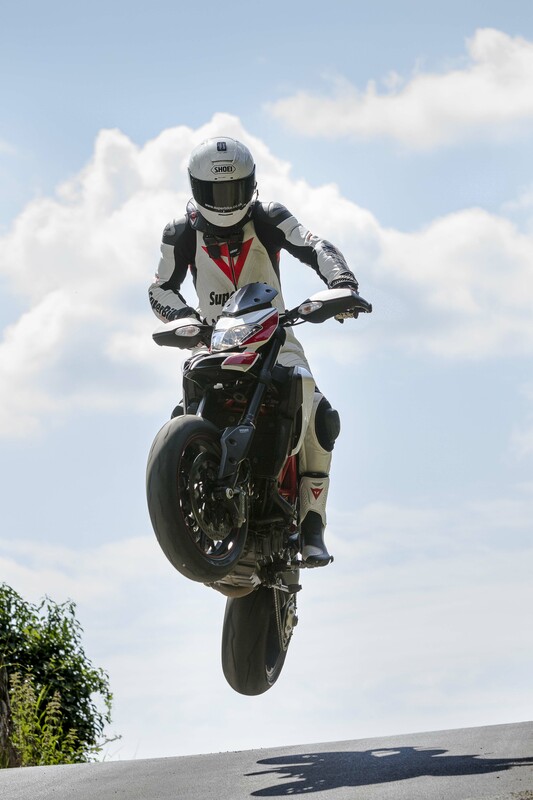 The Hypermotard is the child in all of us that comes out, causes mischief and always gets away with it thanks to a good heart and a cheeky grin. It’s tall. There is no getting around that. If you really can’t cope without having firm contact between Sidi and sidewalk, then you won’t get on with the SP. The base model is lower, but then you don’t get the gorgeous Marzocchi 50mm forks, the Öhlins shock or the forged Marchesini wheels and that just wouldn’t do. Why have cotton when you could stand on tippy toes and have silk, right? Our test bike also had the optional Termi exhaust system, which looks and sounds godly, without rupturing ear drums or alerting the entire country to your childish antics. Now if I just wanted to buy a bike for stunting, jumping and skidding, I’d have a 450cc motocross-derived supermoto, but the Ducati brings so much more to the party. Because it has a proper 110bhp V-Twin, that Hayabusa with Al hanging off the bars isn’t leaving me for dead. Sure enough, what he pulls out on the straights, I’m clawing back into and around the bends. And pulling higher wheelies. Look at that sky, beautiful right? I’m seeing a lot of sky today – 110hp in a tall chassis means I’m wheelying more than usual, which is fine by me. 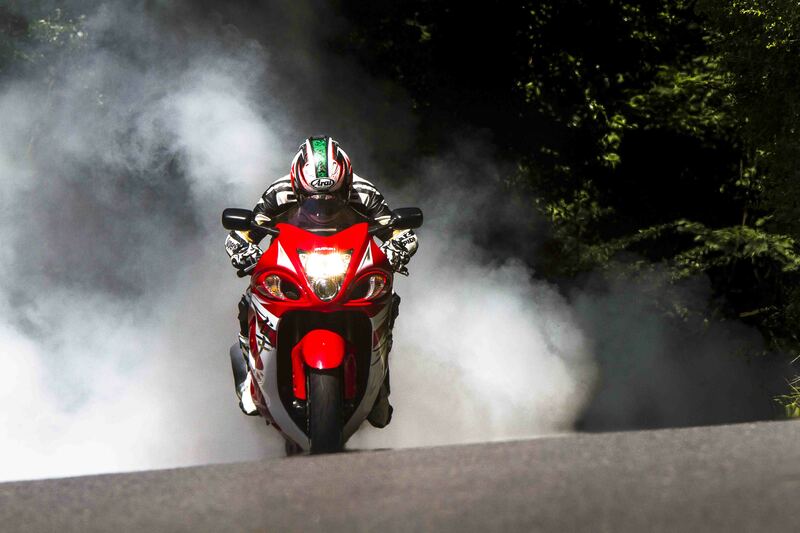 But it’s no one trick pony – skids, stoppies, drifts are all part of a normal ride out on the Ducati. Since it’s been in the garage (obviously I pinched this one at the end of the test), I’ve spent most evenings out searching for bridges to jump, gravel to spray, fords to splash through and quiet lanes to wheelie down. It just makes me want to play, I really can’t get enough of it.